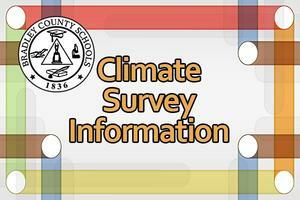 Bradley County Schools is conducting a survey about school climate and learning in school. 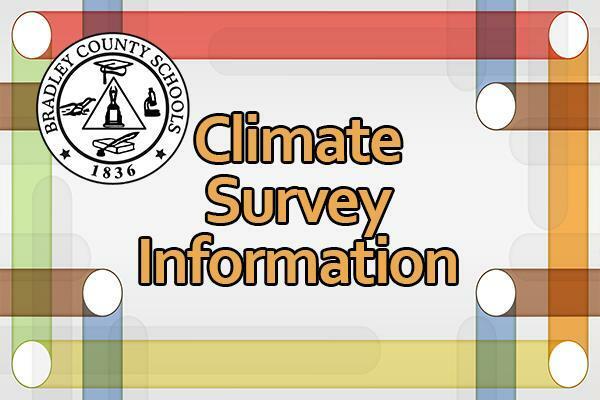 In order to help us ensure a safe and supportive school environment….. Bradley County Schools is conducting a survey about school climate and learning in school. Student participation from the survey will help us gain knowledge about how to improve the school environment and increase academic success. The survey will be administered to students in grades 3-12. We will also be seeking your input in a climate survey after fall break. We are asking for your child to participate in the survey as we value their input. The survey is voluntary and anonymous. It includes questions about relationships with teachers, school principals; school safety, bullying, and substance use; and school rules and the school environment. The Tennessee Department of Education sponsors this survey. You can view the student survey at your child’s school or on the Bradley County Schools website – www.bradleyschools.org . The student survey will be available online for preview between September 22nd and October 5th. The survey will take about 12-15 minutes to complete. Students will take the survey at school after fall break and may skip any question they do not want to answer or may stop taking the survey at any time. Your child’s teacher will be there to help answer questions. This survey is designed to protect privacy. Names are not asked in the survey. If you do not want your child to participate in the survey, please send written notification to the school before the window opens on October 15th. You may contact your child’s teacher or principal with any questions about the survey.